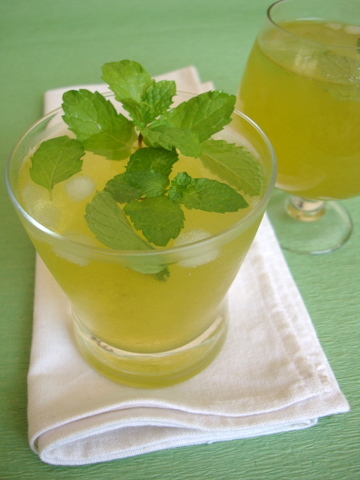 Mint-y, ginger-y, tang-y lemonade – one of my favorite thirst quencher for those hot sultry days. Nothing to beat a homemade summertime beverage that is sure to please your family and friends at a picnic or barbeque party. 1. Prepare sugar syrup first by simmering a cup of water to which 2/3 cup sugar or brown sugar is added. Allow sugar to dissolve completely and cool. Keep aside. 2. In another vessel, bring 2 cups of water to a boil. Turn off heat and add half a tbsp of chopped ginger and 1/2 cup of fresh mint leaves. Place lid and allow to steep. After 10-15 mts, strain the liquid and cool. Discard mint and ginger. 3. Extract juice from 9-10 limes or approx 1 cup of lime juice. Strain and discard the seeds. Keep aside. 4. Take a pitcher and add 8-9 cups of cold water, add the extracted lime juice, cooled sugar syrup and ginger-mint infusion and combine. Add 1/4 cup of fresh mint leaves and salt to taste and combine. Adjust the sweetness by adding more sugar syrup and if it needs to be more tart, add more lime juice. 5. Pour into glasses and serve with ice. For those who want to avoid sugar, replace sugar syrup with a cup of honey or any sweetener of your choice. A pinch of roasted cumin powder or chaat masala powder can be added to each glass of lemonade for added flavor. 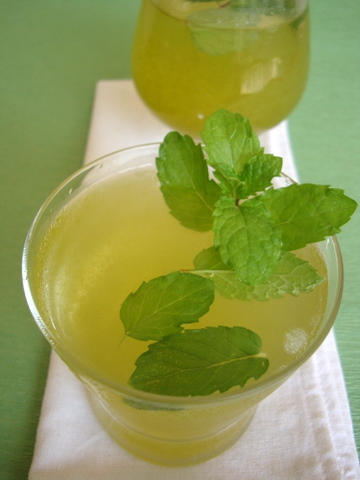 Lovely drink – I love mint and ginger – I love that you have steeped them in warm water for this drink!! Excellent combination of ginger, mint and lemon. Love to have. Refreshing lemonade indeed!! Nice addition of ginger and mint ..
Wow, So refreshing! Perfect timing as i was fed up with the heat and looking for something to cool down. Thank you Sailu for another great recipe. Refreshingly cool. Got a bunch of mint for watermelon juice…shall use it for this too!! Can the syrup be preserved without adding the cold water and fresh mint leaves so that we can prepare the syrup and use it multiple times…. Yes, sugar syrup can be refrigerated and used as and when required. Can this be made a day ahead and refrigerated? You can make the concentrate and refrigerate it. Add chilled water to the concentrate at the time of serving. No salt. Other than that, FANTASTIC!